Hummingbirds are the most intriguing creatures; on flight daily seeking the voluptuous blooms of a summer garden to stay alive. Although their beauty is captivating, they live their lives totally for the sake of survival and do not stay with one mate. The Ruby-throated Hummingbird is the most common to be seen here in the upstate area of New York. However, other types such as the Calliope and Rufous have also been spotted here, according to some sources. It is very interesting to know that hummingbirds only exist on the North American and South American Continents and their migration patterns cover thousands of miles. Most hummingbirds die their first year, but when they've survived a full annual cycle, their life expectancy goes up dramatically. The record age of a banded ruby-throated hummingbird is 6 years, 11 months. The record age of a banded rufous hummingbird is 8 years 1 month. How do female hummingbirds select a mate? 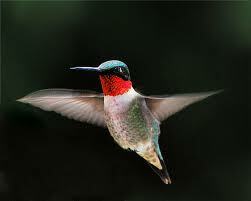 Male hummingbirds, along with many other animals, have what is known as a territory. A territory is simply an area that a male occupies and chases other males away from. A female hummingbird will visit a male's territory, at which time the male performs a courtship display to try to convince the female that he is the best male around. If she likes his display, she will mate with him. If not, she moves on to another territory. Do hummingbirds mate for life? No. They don't even stay together to raise the babies. The female does ALL the nest building, incubating, and caring for the babies herself, and a male hummer will mate with any females that he can attract to his territory. These are NOT romantic birds. 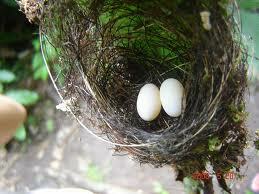 What is a hummingbird nest like? It is not much bigger than a ping pong ball. The female makes the nest with tiny bits of leafy material including little lichens, and weaves it together with spider silk. She builds the nest on a branch in a tree. A hummer will not use a birdhouse. What are hummingbird eggs like? Each egg is the size of a jelly bean, and is white. There are two eggs in a clutch. How long does it take for hummingbird eggs to hatch? Ruby-throats incubate for 11 - 16 days until the eggs hatch. 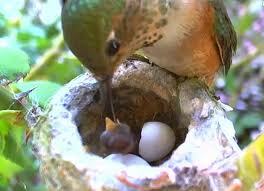 Rufous hummers incubate for 15 - 17 days. How much do newly-hatched hummingbirds weigh? Ruby-throats weigh 0.62 grams when they hatch. This means 3 just hatched hummers would weigh less than one American dime. What do Hummers feed their nestlings? When the chicks hatch, they need protein, not sugar, to grow. So mother hummer spends most of her time catching small insects and spiders for them. When do young hummingbirds learn to fly? Rufous and ruby-throated hummingbirds both begin to fly when about 21 days old. Please share your backyard Hummingbird pictures if you have any.